“I had no opportunity to see the method of making this liquor used by the Dutch, but often drank it amongst them, and thought it very good. The account they gave me of preparing it is as follows: take 12 gallons of water and set it to boil in a copper; put into it about a pint and half or as much as can be held between two hands, of cuttings of the leaves and branches of the pine; let it boil about an hour, and pour it into a vessel, and leave it to cool a little; then put the yeast into the vessel to make the wort ferment; in to take away the resinous taste, put a pound of sugar amongst it. After it has done working, it may be put into hogsheads or barrels, but it is reckoned best to bottle it directly. It will keep a great while, and will not grow so soon sour in the summer as malt liquor. It looks clear and like common beer, has an agreeable taste, and when pour’d out of a bottle into a glass mantles like ale. It is reckoned very wholesom, and has a diuretick quality. “When I afterwards came to Canada, I had several times an opportunity to see the French prepare this beer, which, as they use no malt liquor, is their only drink, except wine brought from France, which is pretty dear. 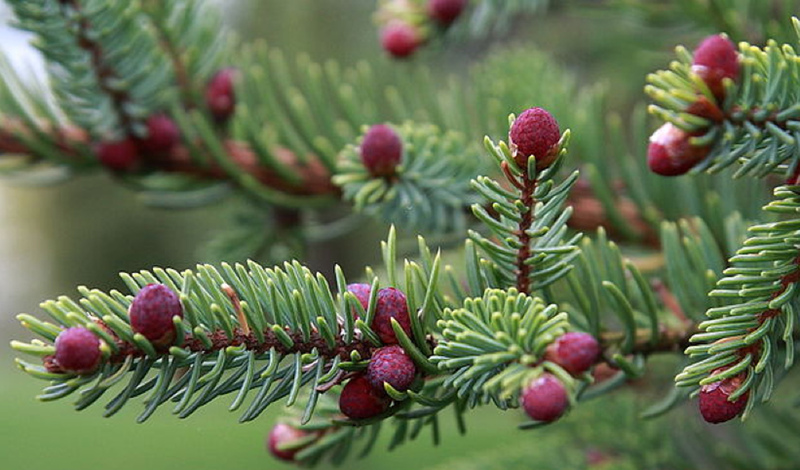 Their way of brewing it is this: After having put the cuttings of the pine into the water, they lay some of the cones of the tree amongst it, for the gum which is contained in them is thought very wholesom; and makes the beer better. The French do not cut the branches and leaves of the pine nearly so fine as the Dutch; for if the branches are small enough to go into the copper, they do no more to them, and they measure the quantity no otherwise than by putting them into the till they come even with the surface of the water. While it is boiling they take some wheat, put it into a pan over the fire and roast it as we do coffee, till it is almost black; all the while stirring, shaking and turning it about in the pan, when that is done they throw it into the copper with some burnt bread. The British Army in North America looks to have learnt from the French the importance of spruce beer for treating and preventing scurvy: there is a strong argument for saying that spruce beer helped the British defeat the French and conquer Canada, by keeping troops healthy who would otherwise have fallen ill with scurvy. John Knox, born in Sligo, who served as an officer in North America between 1757 and 1760 with the 43rd Regiment of Foot, said the troops from New England temporarily occupying Louisbourg after its capture in 1745 were supplied with spruce beer, “this liquor being thought necessary for the preservation of the healths of our men, as they were confined to salt provisions, and it is an excellent antiscorbutic: it is made from the tops and branches of the Spruce-tree, boiled for three hours, then strained into casks, with a certain quantity of molasses, and, as soon as cold, it is fit for use.” When British troops were again involved in a campaign against the French in Nova Scotia in 1757, their commander, the Earl of Loudoun, had insisted on an allowance of two quarts of spruce beer per man each day, for which the troops paid seven pence in New York currency, equal to four and one-twelfth pence sterling, later increased to five pints a day. General Jeffrey Amherst, who followed the Earl of Loudon as commander in chief of British forces in North America, was equally insistent that the troops be well supplied with spruce beer, “for the health and convenience of the troops”, and a “Breweree” (sic) was set up when the British Army was camped at the head of Lake George in what is now north-east New York State in June 1759 with each regiment donating one man to help with the brewing, and instructions to allow five quarts of molasses to every barrel of spruce beer. When Amherst’s troops moved north to capture the French Fort Carillon, subsequently renamed Fort Ticonderoga, the next month, each regiment took with it eight barrels of spruce beer, with a barrel to each company of Grenadiers and “Light Infentry”. Amherst considered spruce beer important enough to record a recipe for it in his journal on 15 August 1759, involving boiling “7 pounds of good Spruce” until the bark peels off and adding three gallons of molasses to the spruce-water, to make 30 gallons of beer. Later on at Ticonderoga, in 1776, after the fort had been captured by American forces from the British during the War of Independence, two enterprising sergeants in the 5th Continental Regiment from New Hampshire, William Chamberlin and Seth Spring, crossed Lake Champlain to gather boughs of spruce, brought them back and with two quarts of molasses and a “quantity” of “spicknard or Indian root” (American spikenard, Aralia racemosa, a member of the ginseng family) for added flavour, brewed a barrel of beer. 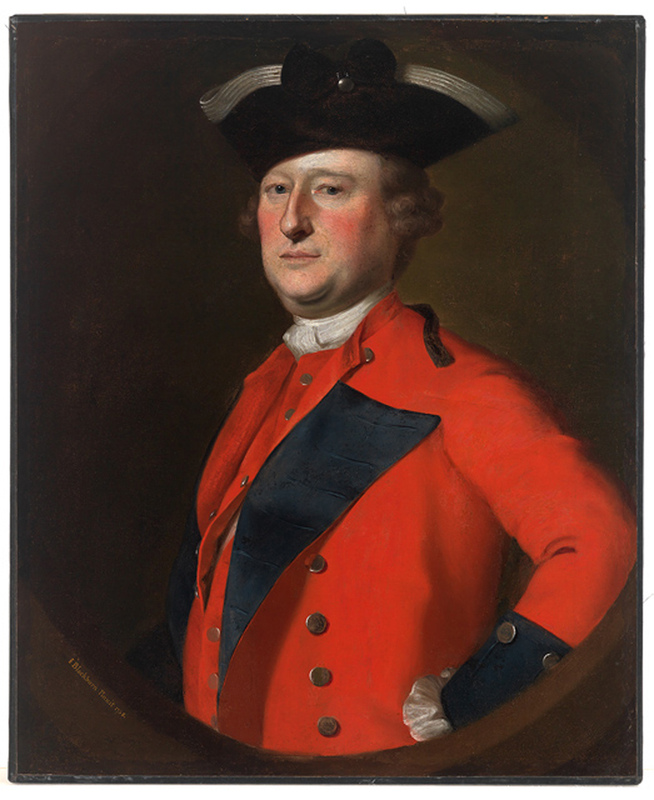 It was instantly popular with the other troops, and Spring was sent to Fort George to bring back two barrels of molasses to make more beer to sell. After six or seven weeks, Chamberlin recorded, he and Spring had made three hundred dollars between them. Take twelve gallons of water and put therein three pounds and a half of black spruce, and boil it for three hours; then put to the liquor seven pounds of molasses just boil it up, strain it through a sieve when milk-warm, put to it about four spoonfulls of yeast to work it; it soon becomes fit for bottling, perhaps in five or six days. Cook and his men brewed spruce beer in New Zealand again in February 1777 on his third and last voyage to the Pacific, and also in April 1778, at Nootka Sound on the Canadian west coast, where enough beer was brewed “to last the ship’s company for two or three months”. When Cook’s two ships reached Unalaska Island in the Aleutians early in October 1778, Cook recorded that both crews were free of scurvy, putting this down in part to the spruce beer, which was drunk every other day. Spruce beer, (not strictly, of course, a “beer”, since it was not made from malted grain) was meanwhile taking off in Britain thanks to the invention of in Canada of “essence of spruce”. Essence of spruce was advertised in Lloyd’s Evening Post in London in February 1770, but only as a cure for “Scorbutic Complaints”, with no mention of brewing with it. The following year, Dr Henry Taylor, of Quebec, patented “a method of producing an essence or extract of spruce so perfect that one pound and a quarter will make sixty gallons of fine spruce beer which will be fit to drink in three days in any climate.” Taylor’s method was to place “tops or small branches” of spruce in a still, distil off half the liquor, with “all the essential oil on the top of the glass … to be carefully saved”, then run the “residuum” in the still into a boiler where there were more “fresh tops or branches of spruce” and boil that up to reduce it. The residuum was then to be boiled again with fresh spruce tops or branches, and then the “essential oil” mixed in. Taylor had a partner in patenting the essence, Thomas Bridge, of Bread Street, London, and by April 1774 Bridge was boasting in print that he had the rights to “the sole making and vending the said Essence.” Bridge told prospective customers that one hogshead of essence would make five hundred hogsheads of beer, and a pound and a quarter of it would make 63 gallons of beer that “may be brewed with very little trouble at sea or land, without fire … and will be fit for use in three or four days. It was, he said, “a excellent table beer, is the best anti-scorbutic yet discovered, is also a fine substitute for malt liquor to people afflicted with the stone, gravel and many other disorders,, as it is allowed to be a great purifier of the blood, by dissolving all viscid juices, opening ostructions [sic] of the viscera and the more distant glands.” By 1784 Bridge was not just supplying the essence, but also brewing “the best double American spruce beer” himself at his premises in Bread Street, “under the inspection of a gentleman long used to that business in America”, and selling it in both bottles and casks. Jane Austen liked spruce beer, agreeing with the anonymous author of The Family Receipt-Book or Universal Repository of Domestic Economy, published 1808, that “The salubrity of spruce beer is universally acknowledged.” Indeed, she liked it enough to make it herself, at home, more than once. In a letter dated December that same year to her sister Cassandra from Castle Square in Southampton, where Jane was living in the home of her brother Frank, then a captain in the Royal Navy, she wrote: “we are brewing Spruce Beer again”, with an oblique joking reference to the great porter casks of Henry Thrale, the former owner of the Anchor brewery in Southwark. 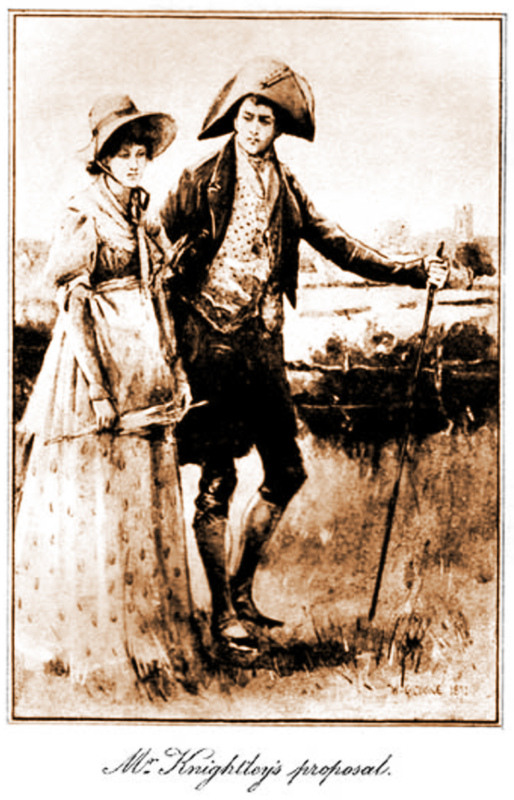 In Emma, written in 1815, both Emma Woodhouse and her lifetime friend, the landowner George Knightley, admit to a liking for spruce beer, and Mr Knightley gives the local vicar, Mr Elton, who has “resolved to learn to like it too” (probably to try to ingratiate himself with Emma), tips on brewing it. It is more than likely that Jane Austen had been introduced to spruce beer by her brother, who had joined the Royal Navy in 1786, and had a reputation as a commander concerned with the welfare of his men. An advert in the Hampshire Chronicle of 5 May 1790 for “essence of Canadian spruce” sold in pots for two shillings and sixpence a time “with directions for making it into Beer” listed more than 20 retailers around the county where it could be brought, including Skelton and Macklin in Southampton, while the City Coffee House, Bath, for example, was advertising in July 1800, a few months before the Austen family moved there, that it sold “Bottled Cyder, Beer, Porter and Spruce Beer”. Twelve pounds of molasses was the equivalent to a bushel of malt, according to a commentator in 1725, so the Family Receipt Book’s recipe would produce 16 gallons – half an ale barrel – of beer of somewhere between 5 per cent and six per cent alcohol by volume. There is some evidence that American-brewed spruce beer came across the Atlantic: on Thursday 17 February 1785, 158 gallons of spruce beer were auctioned off, along with other goods including tea, coffee, wine and rum, at the Custom House in Bristol, a port more likely to deal with ships from the Americas than from the Baltic. 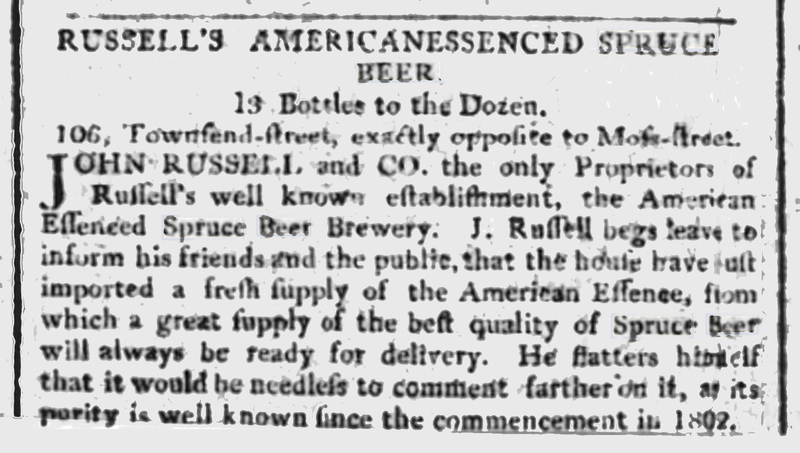 There were certainly commercial spruce beer breweries operating in the United States that could have supplied it: Medcef Eden was advertising his “double spruce beer”, “to be sold at my brewery, Golden Hill,” New York in the Independent Journal in May 1785, for example. American-brewed spruce beer was , at least occasionally, made with hops: a recipe in the New Haven Gazette from 1788 included two ounces of hops –a quarter of the amount used in a recipe for malt beer – and two quarts of bran, together with “one bundle” of spruce and four gallons of molasses to make a barrel of beer. However, plenty of British entrepreneurs were making American-style spruce beer for those who, unlike the Austens, did not wish to make their own. 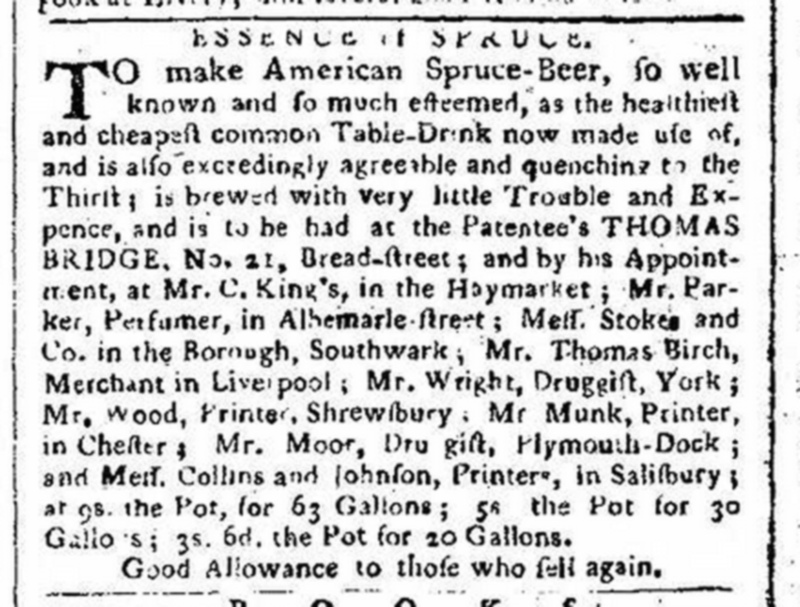 The Observer newspaper on 25 August 1799 carried two separate advertisements on its front page for “genuine American spruce beer” sold by Brown’s Wine Vaults and Italian Warehouse in Paradise Row, Chelsea and “Hickson’s celebrated Spruce Beer … just becoming properly ripe for drinking”, available from William Hickson at his Oil and Italian Warehouse in the Strand. One maker in 1804 in Craven Street, just off the Strand in London, was selling “Imperial Spruce Beer”. There was another spruce beer brewery operating in London, Lowthorp & Co, in the Lambeth Road, around 1806, selling White Spruce “of a most beautiful colour and flavour, almost equal to Champaigne [sic]”, as 12 shillings a dozen bottles, and “fine Brown at 6s per dozen, for Ready Money” (white spruce beer was made with lump sugar, brown with treacle or molasses), and another in Dublin around the same time, John Russell’s American Essenced Spruce Beer Brewery, claimed to have startedb in 1802. (Spruce beer’s success was helped by the fact that several Acts of Parliament, most notably in 1795/6, had established that no magistrates’ licence was needed to sell it.) John Munro, grocer and porter dealer, 10 South Frederick Street, Edinburgh, was advertising in 1804 “Fine Double Spruce Beer” at two shillings and six pence a dozen bottles, table spruce beer 2s, “Families who make their own Spruce, supplied with the Patent Essence and London Molasses on the most reasonable terms.” By 1806 the black spruce tree was growing in Britain, having been brought over from North America, and according to Richard Shannon, the inhabitants of Devon, Cornwall and Yorkshire were all making spruce beer from that tree and the Norwegian Spruce, which was also now being grown in the country. Lovely stuff. Spruce beer was very common in NYC before the British left in 1783 – and especially in the area of the Royal shipyards in Lower Manhattan as I posted about in January. Eden was a bit inland but, delightful, his front lane is still there up an alley. In March, I posted about an excursion in 1760 near the headwater of the Hudson to fit out the British colonial forces. Pretty basic stuff. Double and even triple spruce were recorded in the city’s newspaper notices. It was even recalled with favour in the 1890s by an elderly NYC engineer looking back on his youth. It was then his soda water. I’ve always thought spruce beer to be the great beery contradiction. I’ve read that the scurvy/spruce beer connection, or rather spruce beer’s prevention of scurvy is tenuous at best. I recall a garrison of British troops in New York, I think at Oriskany, who after consulting with local native groups made batches of spruce beer to combat scurvy. 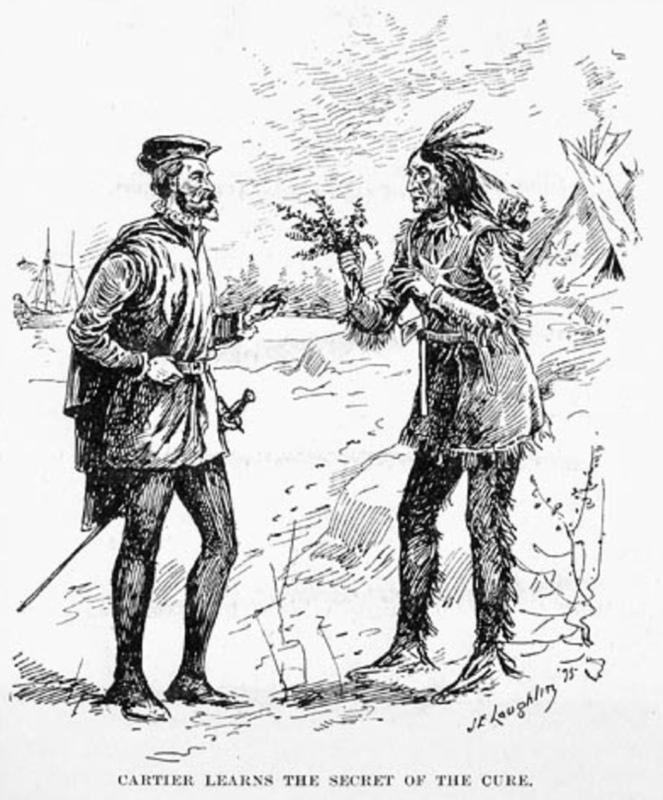 Unfortunately, what the Indians had actually suggested was making spruce water—as in steeping spruce in warm water, like tea. The trouble is, when Vitamin C is boiled it degrades, and the Brits boiled the spruce to make their beer, thereby nullifying its Vitamin C potency. That being said, there are, as you’ve mentioned plenty of references fro spruce beer being used to keep troops healthy. North American spruce beer also seems to have encompassed a wide spectrum of strength. I’ve seen home-brew recipes from the late 18th century and early 19th century which seem to be pretty low in alcohol. Most only call for a gallon of molasses (and sometimes less) into five or gallons of water. Amherst’s recipe is similar calling for a 1:4 ratio of molasses to water. The home-brew recipes seem to be early “pop”, akin to a modern Jamaican ginger beer, perhaps fermented for fizz rather than strength. It’s often advertised for sale alongside less potent potables like soda water, and lemon and ginger beer, table and small beer. And like Alan said, we’ve also come across double spruce beer—which may have been similar to the Family Receipt version—or at the very least stronger than the home brewed versions. Hildreth and Leadbetter, and Medcef Eden both made double and single spruce in NYC in late 18th. George Appleby even sold treble spruce. What’s interesting is that while many of the breweries which advertise making spruce beer (as opposed to merchant/retail advertising) also mention making lower alcohol malt beers—like ale, table, ship’s and small beer—they often do not advertise strong beer. That’s not to say they didn’t, they just didn’t advertise that way. There is also at least one clearly defined “Spruce Beer Brewery” that pops up in late 18th century in New York City advertising. Robert Appleby (whom I assume was related to George) was making both Double and Single spruce (and selling Burton ale out of his cellar, too) at his advertised “Spruce Beer Brewery” at his brewery on the corner of Roosevelt and Rutgers, in 1779. A bit later, however, in 1781, he had followed suit and was making other stuff like table and ships beer (made from imported English malt and Hops)—but at another location on Catherine Street. Fantastic-loved your Jane Austen references. Wish we had it now-would love to taste some!! Thanks Martyn, i would add that in the South in the 18th century we often used yellow pine tips which I doubt has the same vitamin C benefits or pleasant flavor of spruce. We can however grow scurvy grass which may have provided as much protection, that plus the mild winters meant that we did not have much problem with scurvy here. I hope to make some scurvy grass ale soon i will let you know how it goes! As both Alan and Craig have indicated, there were spruce beer breweries operating in New York City in the late 18th century, and there were probably a dozen or so in operation in the city and environs between then and 1845ish. These included John Veitch operating in Harmon Street in the 1790s, Theodore Monytane, the “colored” spruce brewer, on Anthony Street in the 1820s and 1830s, and Farmer, Branch & Co on Fulton Street in Brooklyn in the early 1840s. Other operations made spruce beer into the 1880s and 1890s in other parts of New York State, and reference can be found to “spruce beer factories” in Massachusetts and Connecticut equally as far into the century. By that point, however, spruce beer was primarily a home-made item. A lot of the home-brew recipes include the use of hops, which seem to be a standard additive in the 19th century (some recipes include hops but no spruce of any kind, though it was still noted as “spruce beer”). Farmer, Branch & Co. apparently thought the use of hops was a new thing when they opened their doors in 1840. The ad for their new brewery noted that they had “commenced manufacturing Hop and Spruce Beer [a new article]” which they would deliver to “any part of either cities.” A “social glass of the cool beverage” could also be had in the room fitted up for that purpose at their brewery. Thank you for all that, Gerry: I didn’t write too much about Cook and his anti-scurvy experiments as everything was long enough already (and it wasn’t that elevant to my theme): and I didn’t do too much on the American spruce beer scene as that’s not my area of expertise, and others do it better than I coul. So, spruce beer came over from America – although there was already a thriving local spruce beer tradition – and in no time people were selling double spruce beer, white spruce beer, Imperial spruce beer, ‘highly carbonated’ spruce beer… Plus ça change eh?